Premium Quality Compatible Canon EP22 Toner Cartridge. Canon Lasershot Lbp1120 is a basic monochrome laser printer designed to fit onto the corner of a desk. It offers good performance and great quality prints with its high-yield Canon Lasershot Lbp1120 toner cartridges. This printer weighs approximately 8.4kg and measures 14.3 x 12.1 x 9.4 inch. It has a sleek curved appearance and can easily fit in the most of the small workplaces. 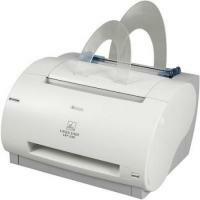 It is capable of producing good quality prints at 600 dpi. Compared to other laser printers, its print speed is a bit on the slower side. It also lacks many of the high-end features like Wi-Fi, duplexer, scanner, an automatic document feeder, and fax capabilities. Its connectivity is limited to USB 2.0. However, its impressive outputs and portable design make it a considerable choice for small office or desk. Canon Lasershot Lbp1120 printer is designed to serve its purpose very well. This basic monochrome laser printer fits easily onto the corner of a desk and produces impressive outputs with its high-yield Canon Lasershot Lbp1120 toner cartridges. It is designed exclusively for Windows and has compatibility issues with Mac OS X. It lacks many of the high-end features like Wi-FI, scanner, ADF, LCD display and fax capabilities. However, it is capable of producing good text and business graphics output. Q. Are coloured Canon Lasershot Series Lbp1120 toner cartridges also available for this printer? A. Unfortunately, Canon Lasershot Series Lbp1120 printers do not support colour printing. Hence, you will not find coloured toner cartridges for this printer anywhere. Q. How do I make the payment when buying Canon Lasershot Series Lbp1120 toner cartridges? Is it safe? A. You can pay by Laser Card, American Express, MasterCard or Visa credit card, Maestro, Switch, Solo or Delta debit card. When you choose to purchase an item on this website the payment will be hosted by Sage Payments which makes sure that your credit/debit card details are secured. Q. Are Canon Lasershot Series Lbp1120 printers loud? A. Lbp1120 printers do not emit much sound on standby mode, however, while printing, the noise levels can go up to 53dB which can cause inconvenience to some users. Q. I am currently shifting my office, so I have to move my Lbp1120 printer. How do I store my Canon Lasershot Series Lbp1120 toner cartridges after removing them from the printer? A. When you remove the toner cartridge from the printer, store the cartridge in its protective bag. If you no longer have the protective bag, wrap the cartridge with a piece of paper so that no dust is accumulated on the drum. Do not store the toner cartridges standing on either ends or upside down. Make sure they are always stored laying flat. Do not expose the toner cartridge to direct sunlight, humidity, or high temperatures. Keep the toner cartridge away from any device that emits a magnetic field, such as the main unit of your computer. Q. I receive an error that says “Insufficient memory available” when initiating certain print jobs. What does this mean and how can I fix this? Closing all other applications while printing this job. Printing the job in smaller sections. Reformatting the complicated pages in the print job to reduce complex formatting and graphics. Q. Are all the compatible Canon toner cartridges same available in the market? A. No, the compatible toner cartridge is made in a number of different ways, each affecting print quality, and page yield. Both issues are extremely important to most of the users. Printerinkcartridges.ie make the compatible cartridges under professional guidance and test it to ensure you're getting a true compatible toner cartridge that will last as long as the original manufactured brand. Q. How many pages can be printed using the black colour Canon Lasershot Series Lbp1120 toner cartridges? A. You can print around 2,500 with the single black colour cartridge. Q. I do most of the printing work, thus need a printer that can print effectively and efficiently in less time. Is Canon Lasershot Series Lbp1120 will be a good option to pick? A. The Canon Lasershot Lbp1120 is a basic monochrome laser printer that produces high-yield printouts from its Canon Lasershot Series Lbp1120 Toner Cartridges. With low power consumption, this printer can print around ten pages in a minute, thus efficient for the users with maximum printing jobs. It can remove the jammed paper easily and is provided with easy paper handling options which save overall time for printing. But the drawback of this printer is that it does not support wi-fi and ethernet connectivity options also it does not support colour applications. Thus, if you print the documents mostly in black and white then this printer is for you. Q. What is the replacement toner cartridge available for Canon Lasershot Series Lbp1120 printer? Q. Do you provide original Canon Lasershot Series Lbp1120 Toner Cartridges on this site? A. We provide both the compatible as well as original toner cartridges for the printers. However, we are limited to only Compatible cartridges, for the Canon Lasershot Series Lbp1120 printer for now. Also, as this printer does not print in colour, we are available with the option for black cartridges only.